Okay, okay. So I've gone a little strawberry crazy this month. I am fully aware that the last four out of the five recipes I've posted on this blog have used strawberries in some way. BUT I CAN'T HELP IT, OKAY?! I have a problem! I admit it! I'm addicted to strawberries! 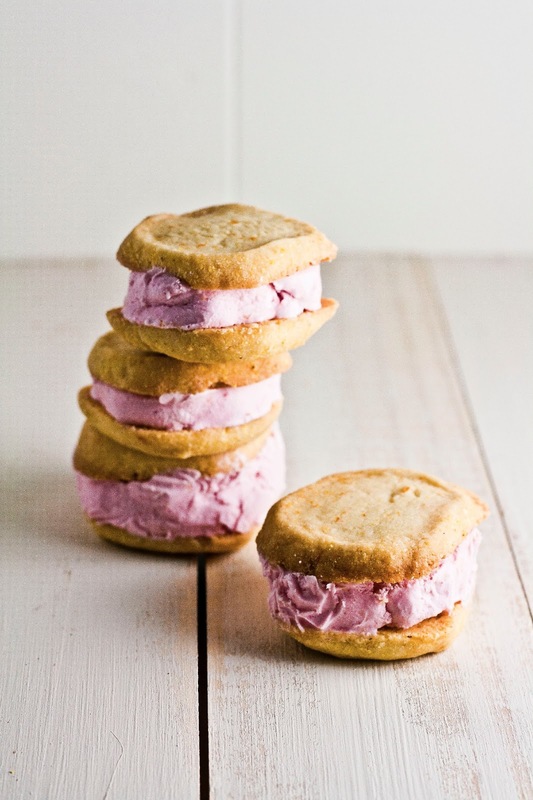 I decided to try making ice cream sandwiches after perusing through the other finalists for Saveur Magazine's Best Baking & Desserts Blog and falling in love with Dessert for Breakfast's Peanut Butter and Jelly Ice Cream Sandwiches. Not only do they sound tasty, but they're absolutely beautiful. Stunning, even. I don't know how Stephanie did it — as you can see in my pictures, my cookies turned out misshapen and my ice cream... well, wrinkly. Don't even get me started on what a nightmare it was to shoot the damn things. Let's just say I ended up with a sticky countertop, camera, hands, pants... yeahhh. Oh well. At least they tasted good. Because cornmeal in baked goods is always a winner, and when combined with strawberries? The perfect marriage. But then again, of course I'd say that, right? Because my name is Michelle Lopez, and I am addicted to strawberries. In a small bowl, whisk together 2 cups all-purpose flour, 2 tablespoons cornmeal, and 1 teaspoon coarse salt. In the bowl of a freestanding electric mixer with a paddle attachment, combine 1 cup unsalted butter and 3/4 cup confectioners' sugar and mix on medium-high speed until creamy and smooth, about 2 minutes. Add 2 teaspoons vanilla extract and and 1 1/2 teaspoons orange zest and mix until combined. Lower the mixer to its lowest speed and add the dry ingredients (from the first step); mix until well combined, about 3 minutes. When all the ingredients are well combined, shape into a small mound (I formed mine into a 6-inch square block), wrap in plastic, and refrigerate until cold, at least 1 hour. When the dough is chilled, preheat the oven to 300 degrees. Unwrap the dough and place it between two pieces of wax paper. Use a rolling pin to flatten out the dough into a 1/4-inch thick sheet. Using a 2 1/2-inch round cookie cutter, cut rounds from the dough and space them 1 inch apart on a baking sheet lined with parchment paper. Sprinkle 1/4 cup cornmeal across all the cookies, until evenly distributed. Bake until pale golden, about 12 - 15 minutes. They will seem underbaked, but the cookies should still be soft when you pull them out in the oven — this is the ideal texture for an ice cream sandwich cookies! Place the baking sheet on a wire rack and allow to cool completely. Once the cookies have cooled completely, transfer to a tupperware and allow to chill in the fridge for at least 3 hours, but preferably overnight. When the cookies have chilled, make the ice cream sandwiches. Place 12 chilled citrus cornmeal cookies upside down on a work surface. One at a time, place a small scoop of strawberry ice cream on each cookie (I used about 2 tablespoons) and top with another cookie. Gently press the cookies together until the ice cream comes to the edges of the cookie. Eat immediately, or wrap in plastic wrap and freeze. Sealed in an airtight container, the sandwiches will keep up to 2 weeks. Ice cream is always a pain to shoot. But I love the sound of this. 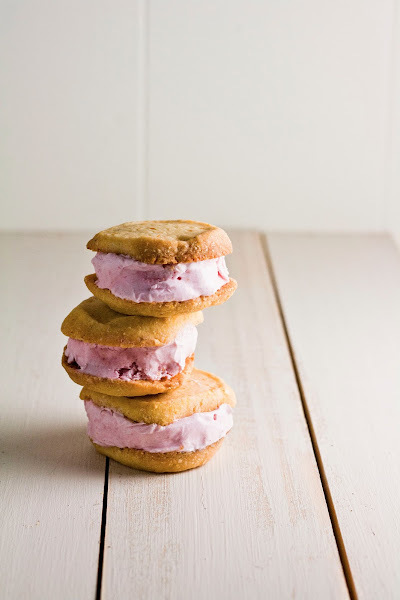 Cornmeal cookies are always a win, and the combination of cornmeal and strawberries and ice-cream sandwiches is so Southern. I love it. These are seriously so gorgeous! I love the idea of the cornmeal. Nice ingredient twist. These are beauties! 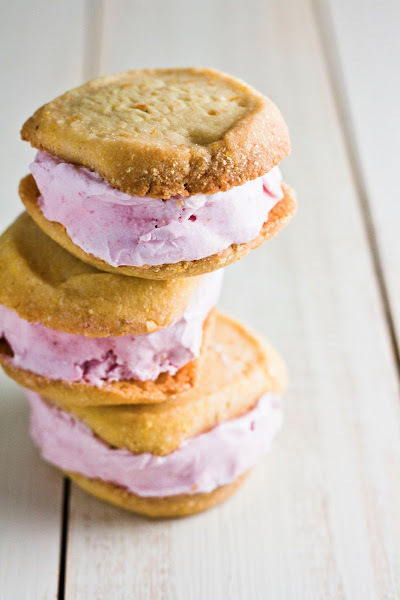 Cornmeal cookies sound so good with that strawberry ice cream. These look and sound delicious. I've never baked cornmeal baked into cookies before. I'll have a to give it a go. Great photo's Michelle. These look super nostalgic! Love 'em! Hi Michelle, I know this is an older post but I just wanted to let you know the "print the recipe" version of the recipe doesn't tell you what to do with the extra 1/4 cup of cornmeal! AH oh no! Sometimes that happens when I'll go back and edit something, I'll forget to do it in the print version. Thanks for the head's up, I'll change it soon!